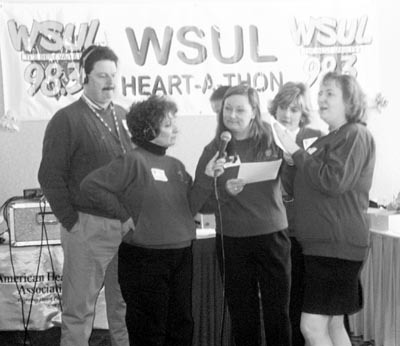 HELPING TO RAISE funds during WSUL Radios and the American Heart Associations annual Heart-a-Thon at Kutshers in Monticello Saturday were, from the left, WSUL News Director Bill James, Sales Manager Helena Manzione, County Legislators Kathleen LaBuda (the events co-chair) and Jodi Goodman, and Jeffersonville Mayor and event co-chair Susan Hemmer. MONTICELLO  February 27, 2001  Awareness. That was the focus of the 23rd Annual Heart-A-Thon on Saturday at Kutsher's Country Club in Monticello. And once again, Sullivan County heeded the call. This year, a record $52,498 was raised. The proceeds will be split evenly between the American Heart Association and the Cardiac Pulmonary Department of Community General Hospital of Sullivan County. This is the first year that 50 percent of the money will stay in Sullivan County. "This has been going fantastic," commented event co-chair Susan Hemmer. "We have had enormous support of volunteers. It has been a great experience. I look forward to next year." "In only four hours, we have raised over $13,000," event co-chair Kathleen LaBuda added. "We will top last years mark [of $46,000]." WSUL broadcast the event live from 8 a.m. to 5 p.m. Many local dignitaries stopped by to make donations and man the phones, and Kutshers lobby was bustling with activity. "We have close to 250 volunteers here from every town and village in the county," WSUL Station Manager Bill Reynolds proudly stated. "We have had pledges from every ZIP code. It has been phenomenal. Everyone within 100 yards of here can feel the enthusiasm. It is great to be a part of an event that makes a difference in the community." "We really pulled together as a community," added Sullivan County Legislator and CGH Director of Volunteer Services Jodi Goodman. "We need to focus on improving our community." While on the air, many experts explained the dangers of smoking and the benefits of healthy living. Several programs were highlighted throughout the day, and many former and current employees of WSUL stopped by to help out. One of the day's highlights was "The DJ Summit." For one hour, WSUL radio personality Josh Sommers and former WVOS host Paul "Redneck" Decker shared the airwaves. They talked, encouraged people to call in, and even had an arm wrestling contest (won by Sommers  but many were suspicious of the results). By the end of the day, organizers said the Heart-A-Thon accomplished what it set out to do: raise a great deal of money for two worthy causes and raise people's awareness of heart disease. And yes, volunteers are already looking forward to next year.